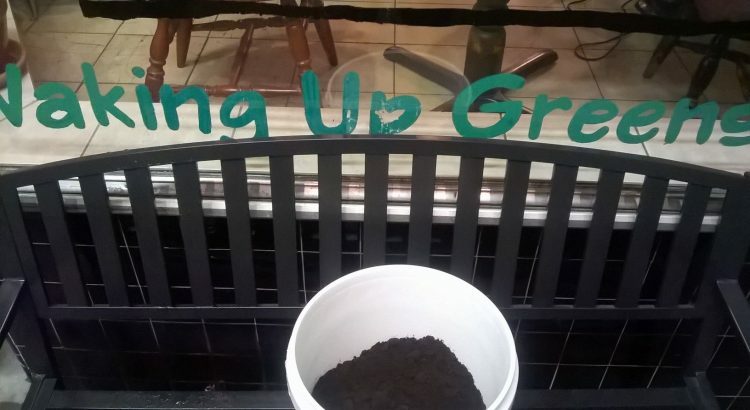 Tate Street Coffee House has been waking up Greensboro with coffee and their recycling efforts and hopefully will wake up/inspire others to recycle coffee grounds and other materials as well as use fewer plastic bags. They have been involved in recycling from the beginning in 1993. The tables and chairs as well as decor were recycled. Coffee grounds have been available for customers for years. 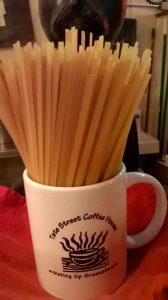 Months ago they began using pasta for stir sticks replacing plastic ones. They use real coffee cups, plates and silverware as much as possible. 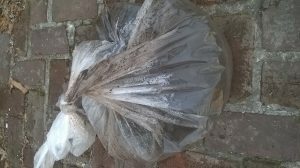 Up until now, coffee grounds were initially dumped in plastic bags and disposed of if not taken by a customer. 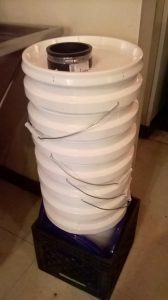 Beginning today, the grounds will go into a 5 gallon bucket and be retrieved by customers for composting or fertilizer. Austin, the manager, came up with a clever idea to replace the trashcan with top which was positioned under the expresso machine. This should ease the transition. No more grounds or plastic bags going to the landfill. This effort along with recycling information will be shared with customers. From the Tate Street Coffee House website.